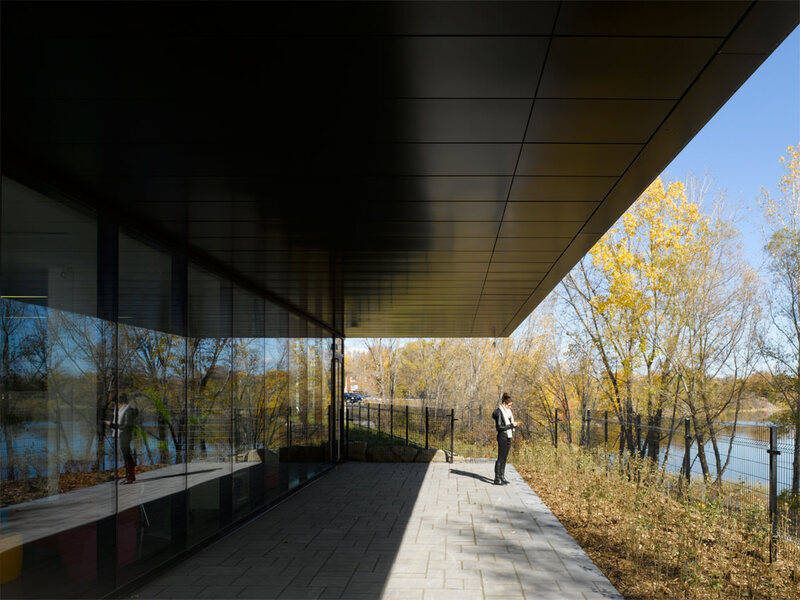 Sitting on the bank of the Rivière des Mille Îles, the Guy-Bélisle library aims to reconcile the urban form of Saint-Eustache with the history of the riverside side. The building functions as a bridge between the city and nature, tranquility and movement, culture and community. 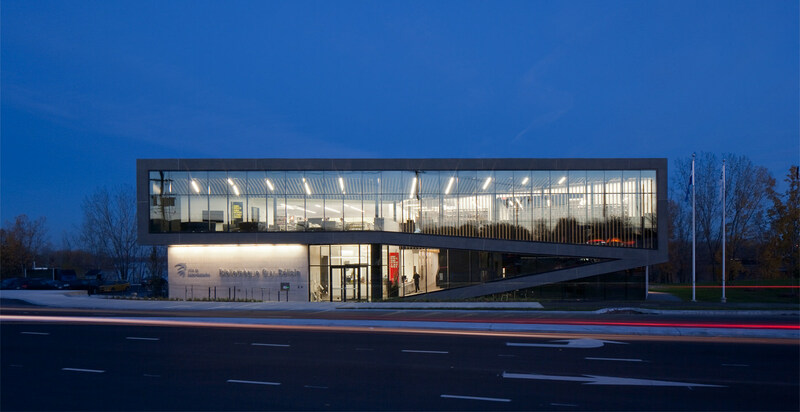 The Guy-Bélisle library is a 2 600 square meter public library with a multipurpose space that services the city of Saint-Eustache, located north of Montréal. 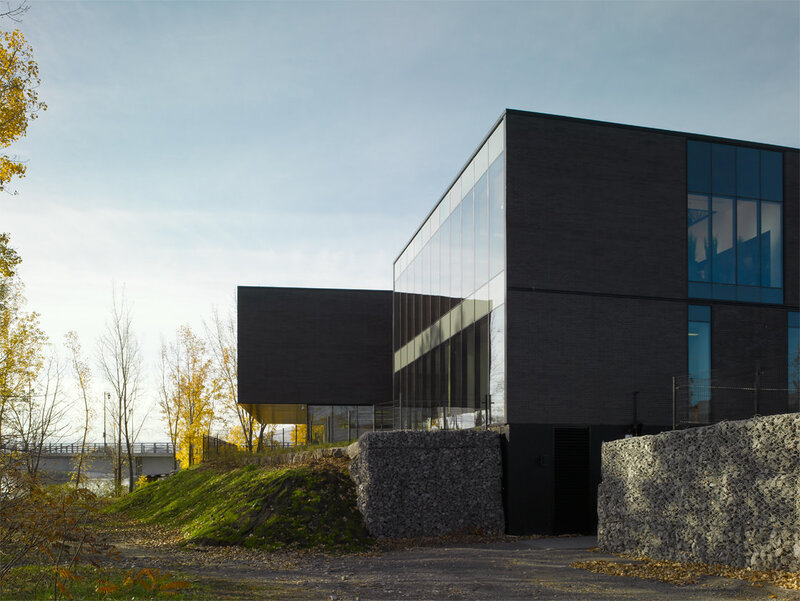 The dark mineral clad building marks the entry to the city on a picturesque tree lined riverside site. The volumetric concept of the project is based on a simple extruded rectangular box that is folded twice. 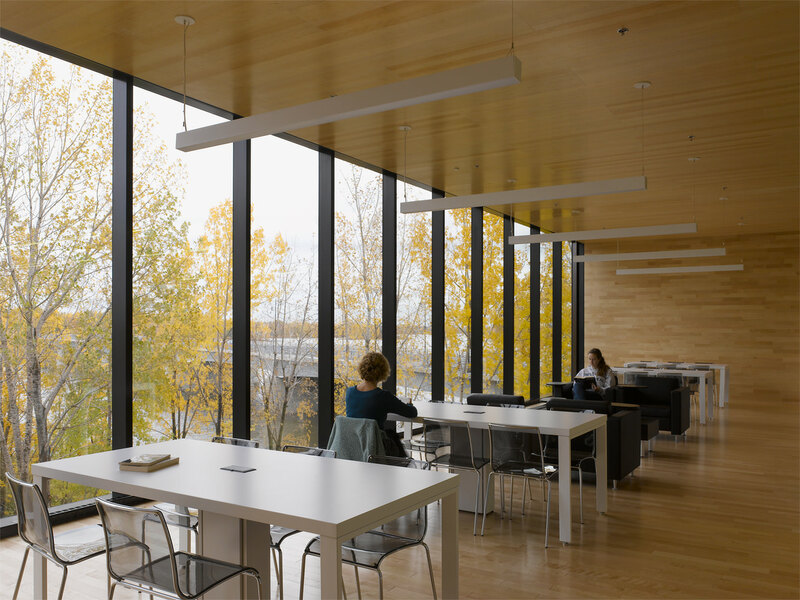 At each end of the elevated box, glass surfaces open fully to panoramic views of the river at the level of the abundant tree tops. The layout of the building enhances the peaceful presence of water, while making reference to the natural strata of the riverside landscape. Along the main road, the sculptural wood screen animates the façade from the interior and defines the energetic young adult work space. The wood textured precast concrete frame of the principal façade presents the activities of the library to the city, and the city to the library. The fenestration and articulation of the two side elevations are strategically minimal. They highlight the transparency of the front and back of the project, while organizing the interior programmatic spaces of the library. The library is spread over two levels. At ground, the users find the main entry hall, a multipurpose area, a playroom and children’s books. 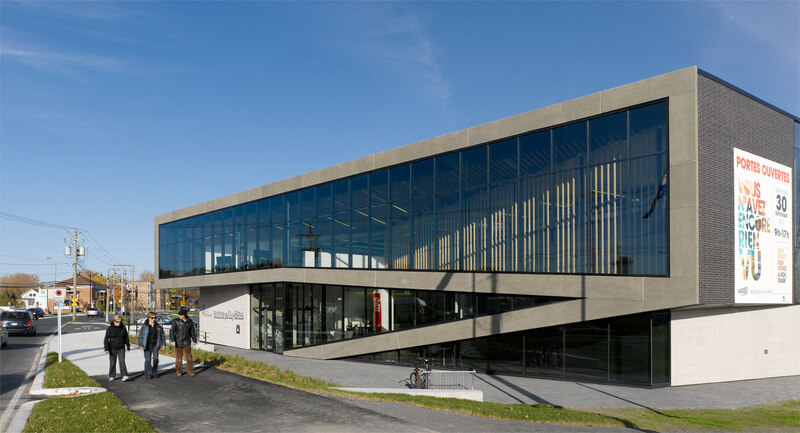 The first floor contains two reading rooms, a cafe, the adult section, a computer lab and a space dedicated to genealogy with its own showcase, a tribute to the patriotes’ stay in Saint-Eustache. 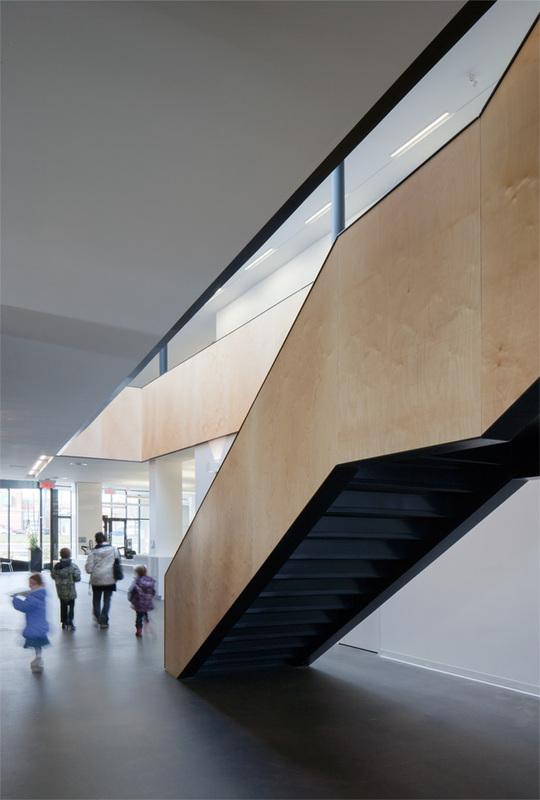 The reading areas are located at the back of the site and are wrapped in warm wood cladding on all interior surfaces. 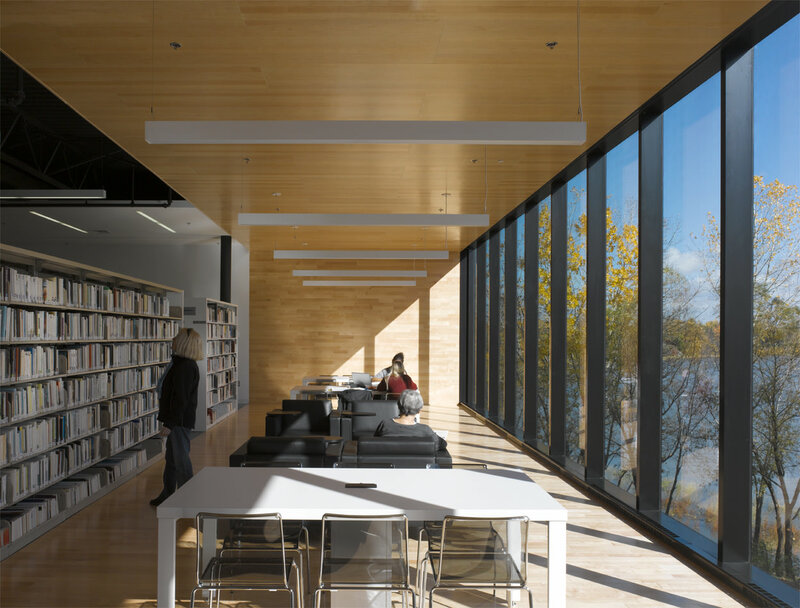 Like a tree house, one reading room is cantilevered 3.5 meters over the sloped river bank, reinforcing the dramatic views while providing cover for the exterior terrace. With its carefully designed volume and its engaging spaces, the library creates a strong presence in the city and provides a destination for all residents.